Horizontal pupils slit the bulbous eyes swivelling in a large alien head, floating above a bizarre tangle of arms rippling with color. Some species glow, others can kill you with a poison they don’t even make, but those are both unique specializations. Even their basic body plan is unusual, and in honor of Cephalopod Awareness Week, I couldn’t resist writing a post about the most intelligent of all invertebrates. Cephalopods are a class in the phylum Mollusca, which also includes Gastropoda (slugs and snails). Mollusks are a diverse group, but all their members share a certain set of characteristics. They have a head, a visceral mass (the part of their body where all their internal organs are concentrated) and a muscular foot. This soft body is covered by a skin layer called the mantle, which often secretes a hard exoskeleton (such as a shell). Unique to this phylum, they feed using a structure called a ‘radula’, a chitinous ribbon intricately embedded with teeth which scrape or cut prey- chitin is the substance that makes up the aforementioned exoskeleton, and in its purest form, it is a translucent, pliable but tough material. Cephalopods have this radula, alongside a horny chitinous beak, although it is reduced in octopuses. Their head is enlarged, along with their mantle, and the muscular foot is modified into tentacles. Although Nautilus still have shells, both squids and octopuses either have internalized shells, or they are completely absent. The Nautilus are the most primitive of the three though- they’ve been around an impressive 500 million years, appearing in the Late Cambrian period. It’s a little harder to figure out when exactly octopuses, squids and cuttlefish showed up, since their soft bodies didn’t exactly fossilize well. But the soft-bodied ones are the charismatic, scary ones: their iconic heads, their tentacles trailing behind them, the circular suckers which are sometimes equipped with small teeth or hooks. An ominous real-life version of the mythical Kraken, the colossal squid has both. 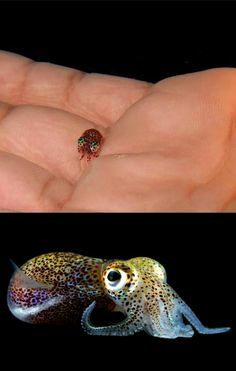 While this animal can grow to be up to 46 feet long, it belongs to the same class as the pygmy squid which could easily fit on your fingernail. Small or large, they both are quite obviously squid, and although they (and octopuses) are easy to identify, spotting them in the wild would be quite a feat. Calling them masters of disguise would not be an exaggeration; they change color in startling displays to hide in plain sight. That isn’t the only interesting layer. Beneath these general pigment-containing chromatophores are specialized structures called iridophores. As their name suggests, their colors resemble glitter-- they make structural color, which means they reflect certain wavelengths of light due to their shape. The effect is akin to that of light bouncing off a peacock feather or abalone shell, but this isn’t quite as rapid as the first layer. Although squids control both of these with their neurons, the chromatophores require a significantly smaller stimulus. They use these cells to change colors to camouflage themselves against the backgrounds behind them, and then some. Their first method of defense is to hide: sometimes they squeeze into tiny spaces, other times they pretend to be a different animal. Their soft, shell-less bodies allow them to squeeze through incredibly small areas: the size of their hard beaks determines the minimum diameter they can fit, so once they find an appropriate hiding place, there’s no getting them out. Mimic octopuses, specifically, can change the color of their arms to resemble poisonous banded sea snakes and wave them around in movements reminiscent of them, and they have even been observed trailing along the ocean floor in formations resembling lionfish. If they still get attacked, they have secondary defense mechanisms: some have been known to detach an arm to distract their predator and flee. This process, the same one used by lizards to detach their tails, is known as autotomy. Another trick they use is spurting ink, stored in a special sac inside them, into the water around them. This confuses their predators by inhibiting their vision, and they use this as an opportunity to escape. Once they get away, catching them is hard: they use jet propulsion to fly through the water, and some even use this propulsion to fly through the air! It’s not just a famous Beatles song. Common octopuses collect crustacean shells and curios to build fortresses, or gardens, around their lairs. Cephalopods have not one, or two, but three hearts, and since their blood consists of hemocyanin, which contains copper (as opposed to the iron in our hemoglobin), it is colorless in their bodies but turns blue when exposed to air. Cephalopods have perfectly spherical lenses, and due to the arrangement of their neurons, lack a blind spot. Their camera-style eyes basically see everything, and the organization of their photoreceptors also results in them being able to see polarized light: basically, they see way better than us. So clearly, and I’ve already said this, they’re very smart. In fact, they have the largest brain to body mass of all invertebrates; it actually falls somewhere between cold-blooded and warm-blooded vertebrates. However, the arrangement of their brains is a little different. In an octopus, for example, two-fifths of its neurons are coalesced into a traditional brain in its head. Three-fifths (or two thirds, according to other reports) are distributed amongst its arms- giving each one, essentially, a mind of its own. Detached arms continue reacting to stimuli even after their connection to the brain has been severed, to a certain degree, exhibiting a phenomenon known as limited functional autonomy. Yet, due to chemoreceptors embedded in their suction cups which recognize octopus skin, the arms never get tangled up with each other. These chemoreceptors allow an octopus to taste whatever it is touching too! And yet, despite this advanced intelligence, they die incredibly young: a recent study ageing wild octopuses (Octopus tetricus) found the maximum ages to be 677 and 542 days for males and females respectively. All male octopuses die after reproducing, and the maximum age of a Giant Pacific Octopus in captivity was five years. This same study finally figured out a way to determine their ages efficiently: by weighing their stylets. A stylet is a small cartilage-type structure found in the mantle of an octopus, and it grows in daily increments. Previous methods would dissect out a small section of this stylet to examine it under a microscope. Similar to a tree, the deposits on this stylet take the form of concentric circles, and by counting them, they could determine the age of each animal. This was expensive and time consuming. Alongside the circles, each stylet’s weight is also strongly correlated to the age of the animal, which is far simpler.